The Wels National and International Show has been a firm favorite on many people's calendars since more than twenty years as this event is among the first shows of the new show season in Europe. This year Anne Heiloo, president of the Arabian Horse Society in Austria (VVOE) and responsible for the show, had to deal with some complications. The long-time VVOE secretary Ilse von Heske-Bothenwald was killed by her son; usually, Mrs von Heske-Bothenwald was heavily involved in all the organizing work of the show. So Anne Heiloo accepted the challenge and was successful. Wels, the small village in the foothills of the Alps, near Linz in Austria, welcomed Arabian horse celebrities from all over the world to compete in front of a handpicked board of judges: Dr. Gianmarco Aragno, Claudia Darius, Cedes Bakker, Christian Moschini, Anna Stojanovska and Koenraad Detailleur. Connected to the Pferd Wels fair, the national and international Arabian Horse Show profit from it as many visitors passed by and enjoyed the show classes. "Everything went smoothly, we had a lot of spectators and many high-class horses," says Anne Heiloo. 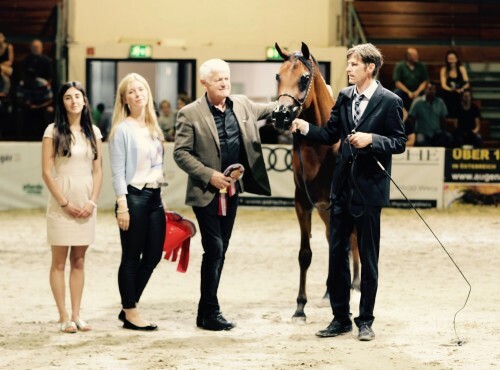 "And I am especially happy to see that the Austrian breeders competed successfully at the international show, best of all Al Hambra Arabian, Diamond Arabians, and Mario Matt Arabians. I am very proud to see this. Austria is a quite small country. We do not have so many breeders and it is maybe not so easy to breed high-class horses constantly. On the other hand, the aforementioned farms invested in top class breeding horses; now they can reap the fruits of this breeding philosophy." The first medal decisions were made on the Austrian National Championship. It turned out to be an amazing weekend for Cornelia Kolnberger of Diamond Arabians. Her horses won two gold medals, one silver, one bronze and they were achieved with the title Best Austrian Bred Mare and Stallion. All horses are tracing back to Diamond Arabians' foundation mare, Rawayeh. "I have bought Rawayeh as an older mare more than ten years ago," Cornelia remembers. "She not only had a beautiful head but the sweetest character and my daughters favorite riding horse. On top of that, Rawayeh gave me two valuable daughters, Riva and Ravennah, to built my own breeding program." Rawayeh traces back to globally influential broodmare Rodania on both sides of her pedigree. Egyptian bred Kais I is Rawayeh's sire and has three lines to Rodania through Alaa El Dine and Om El Saad. On the female side of Rawayeh's pedigree, we find English bred Maleika, by El Zayid. Maleika's dam Jaderus Flying Angel is tracing back to Rodania, too. DA Alihandra was the unanimous choice of the judges for Gold Champion Junior Filly and was also awarded the title Best Austrian Bred Mare. The two years old filly is by World and ANC Champion Stallion EKS Alihandro, representing the strong sire line of Marwan Al Shaqab and back to Ruminaja Ali – Nazeer. On the female side of DA Alihandra's pedigree, we can see the wise choices Cornelia Kolnberger made in finding the right stallions for her broodmares. DA Alihandra's dam DA Miss Justice is by WH Justice out of a CH El Brillo daughter and back to Riva – Rawayeh. 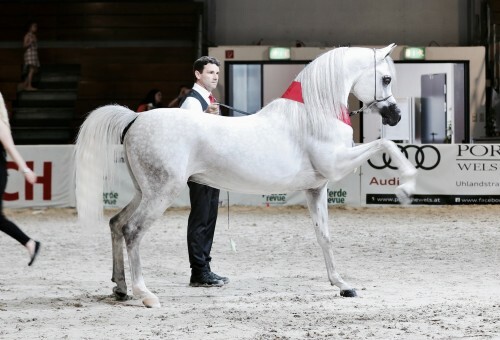 Silver Junior Champion Colt DA Kaheel Al Kanz, bested by his stablemate DA Jakandro, by EKS Alihandro, achieved the title Best Austrian Bred Stallion (won by highest points). DA Kaheel Al Kanz' sire is the magnificent Kanz Albidayer, who has an enviable show record with major championships in both Europe and the Middle East. His dam is DA Kleopatra out of Riva traces back to Rawayeh on both sides of her pedigree as her sire DA Kandahar is out of Ravenna. Former World Cup alpine ski racer and Olympic gold medallist Mario Matt saw his beautiful WH Justice daughter M.M. Eluise winning the National Gold Champion Senior Mare. M.M. Eluise was already Austrian National Gold Champion Filly and Best Austrian Bred Arabian Mare back in 2011. Her dam is Esfera, by Fame VF and out of Espressa, making her a full sister to European Triple Crown Winner Essteem. Al Hambra Arabians bred the National Gold Champion Stallion Al Nadir. The grey Ajman Moniscione son Al Nadir is a constant winner at various show grounds. His dam Al Dafina is by Egyptian bred Mahadin out of El Estrella by Essteem. At the international part of the show, aforementioned DA Alihandra competed successfully, too, and achieved International Gold Champion Junior Filly in a strong competition with D Yara and Safiat Al Shaqab winning Silver and Bronze. Dubai Stud's D Wasayef, by Wadee Al Shaqab, went away with International Gold Champion Yearling Filly. Silver was awarded to AJ Norah, another beautiful filly by AJ Mardan, bred and owned by Ajman Stud, UAE. DA Ariyana, a full sister to DA Alihandra and also bred and owned by Cornelia Kolnberger, achieved Bronze. Ajman Stud's AJ Mardan is also the sire of International Gold Champion Yearling Colt AJ Radman. The Silver winner My Star K.A. came from Belgium bred and owned by Knocke Arabians. My Star K.A. is by S.M.A. Magic One out of a mare by QR Marc. 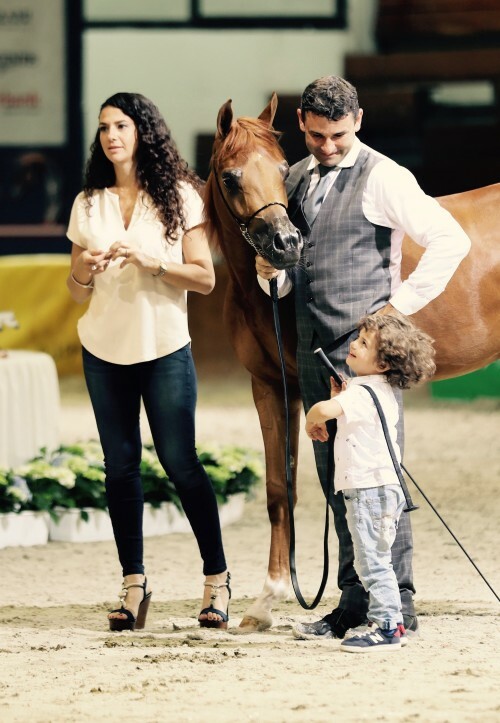 Sax Arabians, Germany, is the breeder and owner of Bronze winning Mahil Al Marenga, by Kahil Al Shaqab out of Miss Marenga, representing the valuable Marenga family – tracing back to Mammona - at Sax Arabians. Sax Arabians was successful with another representative of the Mammona line: International Gold Champion Junior Colt Lamandro, by EKS Alihandro and out of Lamana by Laman HVP. Lamana is tracing back to Mammona through Neschi – Nevada. The Silver Champion Colt was bred by US Americans Jane and Kristi Hopp and is on lease to Aretsu Arabians, Italy. His name is Vesuvius DPA, by EF Kingston out of Psymply, so Padrons Psyche on both sides of his pedigree. Elan de Marc K.A. achieved International Gold Champion Senior Mare, bred and owned by Knocke Arabians, Belgium. The five years old gray Elan de Marc K.A. is by QR Marc out of the Monogramm daughter Espadrilla. Twice Polish National Reserve Champion Espadrilla herself is out of the wonderful producer and international showstopper Emanacja. Another horse bred and owned by Sax Arabians, the Khidar daughter Esskhija Bint Essteema, achieved silver. Bronze went to M.M. Eluise, Mario Matts previously mentioned WH Justice daughter. The winner International Gold Champion Senior Stallion Mahder Al Jamal is bred and owned by Jean Mattens, Belgium. Mahder Al Jamal is a gray son of Straight Egyptian Nader Al Jamal, who passed away way too early. Mahder's dam Mahity El Jamaal is by Dakar El Jamaal out of Mackenzie and traces back to the Aswan daughter Panagia, the dam of immortal Balaton. 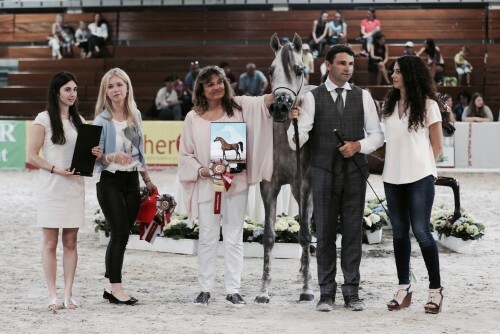 The title Best In Show (highest score) went to D Wasayef, so the Wels Arabian Horse Show was a dynamic start for global player Dubai Arabian Horse Stud into the European show season.